Left to me I rather grill in a compactment I have in my oven, which has been stressful and sometimes gets burnt. The grilling machine is good, at least it could help for all the outdoor even and save the stress. the question is hope it does not have any malfunction that will give it a short life span? Grilling can be stressful at times. Sorry to hear that you are having problems with you machine. I would be glad to help you find a solution for it if you would like. PM me @JerryMcCoy and I will search for a solution for you. Thanks for the comments. Wow, I really had no idea there were so many types of Japanese grilling and to be perfectly honest, I had no idea they used a special kind of charcoal with such an old tradition associated with its use! It sounds like all the coal comes from the same tree (and of course where it comes from determines the quality of the coal like you said), but can binchotan coals be made from other trees? Or just from the umabe white oak. I also didn’t know about beef being reintroduced into Japan from American grilling influence. Very great and to the point article. Thanks for sharing. I did not even begin to cover all of the different types of grilling there are in Japan. The charcoal they use is so good that it can be reused several times. The charcoal in Japan is much sought after. If you were to get the same charcoal here in the United States you would pay $150 or more for it for a 20 pound bag. There are over 50 types of grilling in Japan. I will be posting some recipes from around the world shortly. Thanks for reading. Even though you are not into grilling, you have probably had grilled food of some sort in the past. I was amazed at the different types of grilling there were in Japan. The binchotan charcoal is probably the finest in the world and you don’t have to burn it done completely like other versions. It gives the food a remarkable flavor that can not be duplicated any other way. I will be posting some recipes soon that can be converted to stovetop or oven. Thanks for the read and comments. Have a wonderful week. If I have not replied to your comments before now I do apologize. I try to answer everyone in a timely fashion. I am glad that you found my article interesting. If you have any comments on how I could make my articles more interesting then I would certainly appreciate your input. This article was interesting and well informed on the different types of Japanese styled grilling there is. Yakitori grilling sounded interesting and when I read more about it, in which Beef was introduced in Japan. 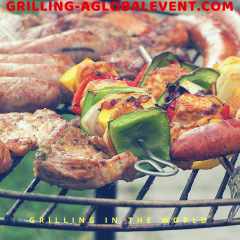 I don’t know much about the different types of grilling styles and it was great to know more about binchotan charcoal, which gives the meat its flavor. Thanks for the read and comments. I was surprised when I was doing my research to find that the binchotan charcoal was one of the most important aspects on grilling in Japan. People will ask where the charcoal comes for more than anything they grill. They are so many types of grilling that I could not list them all at this time and will do an update at a later time to more fully explore the others. Again, thanks for the comment and check back to see if I have added any new information that will be useful to you.